By the early 20th century, after four centuries of expansion and development, the most powerful states of Europe and the United States had come to dominate the world. These states included Austria-Hungary, France, Germany, Great Britain, Russia, and to a lesser extent, Belgium, Italy, the Netherlands, Portugal and Spain. These states controlled directly or economically just about the entire continent of Africa and the better part of South and Southeast Asia. Beyond Europe the Ottoman (Turkish) Empire was unraveling, China was in turmoil, and Japan was modernizing and seeking an empire. With the battle for the American West essentially over by 1890, the United States cast its eyes beyond its shores to spread its influence and secure its interests. In 1898 it had won the Spanish-American War and gained the overseas territories of Guam, Puerto Rico, and the Philippines. My grandfather had helped to build the Panama Canal which opened in 1914. At home Americans had become focused on “Progressive” issues in their search for a better society: poverty, prostitution, women’s rights, temperance, corporate greed, and environmental conservation. In 1912 they elected Woodrow Wilson to the presidency, and he readily used his powers for progressive ends. In 1913 and 1914 the Federal Reserve system was established to regulate the money supply, credit, and the banking system; the Federal Trade Commission was established to regulate commerce; the Clayton Antitrust Act was passed, prohibiting some of the worst corporate practices. What historians call the era of the “modern, activist state” had clearly begun. Volumes have been written about the causes of World War I, which historian Jackson Spielvogel has called “the defining event of the twentieth-century.” Historians cite the following major factors. The international competition between the major powers had reached a very high pitch. 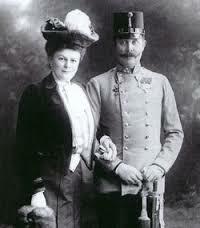 Austria-Hungary competed with Russia and other minor powers for influence and control in the Balkan Peninsula. Great Britain, the dominant naval power for 150 years was now challenged by a united and assertive Germany, determined to play a more prominent role on the world stage. Second, the small Kingdom of Serbia sought to free all Southern Slavs from Austria-Hungary and form a new pan-Slavic state. This agitation was a nagging thorn in the side of Austria-Hungary. Third, since the end of the Napoleonic Wars in 1815, the European powers had shown a certain flexibility in political-military alliances to match the interests they sought to protect. 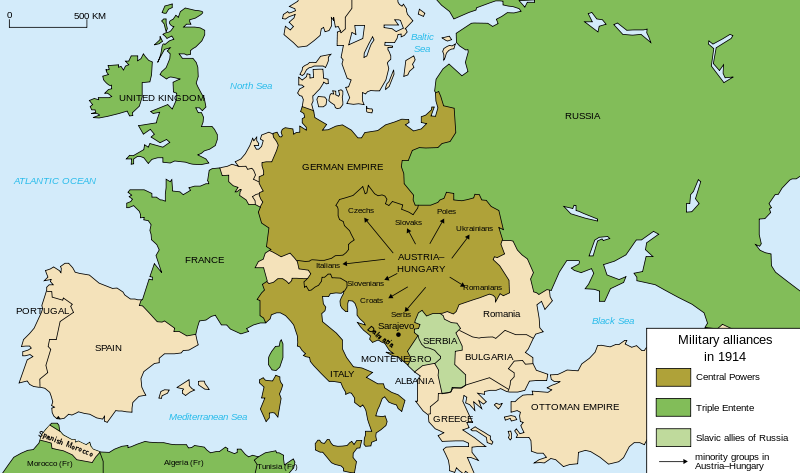 By 1914 this flexibility had given way to a more rigid bipolar system: the Triple Alliance (Austria-Hungary, Germany, and Italy) versus the Triple Entente (France, Great Britain, and Russia). Fourth, while the size of European armies had grown dramatically during the Napoleonic Wars, they now continued to grow not only in size but also in weaponry and technological and logistical sophistication, a consequence of the Industrial Revolution. Also, in preparation for a possible conflict, several states had developed elaborate and fairly rigid war plans. The German “Schlieffen Plan,” for example, assumed a simultaneous war against both France and Russia, not one or the other. The Russian plan assumed a war against both Germany and Austria-Hungary. The spark that ignited the war was the assassination on June 28, 1914, of Archduke Franz Ferdinand, the heir to the throne of Austria-Hungary, by Serbian nationalist Gavrilo Princip. On July 28 Austria declared war on Serbia. Within two weeks the major powers of Europe were at war; the U.S. would join the war in 1917. This entry was posted in Uncategorized and tagged Archduke Franz Ferdinand, causes of World War I, Fred Zilian, start of World War I, Triple Alliance, Triple Entente, war, World War I. Bookmark the permalink.